Back in June, Marsha and Judy came to London on a 2 week tour of the UK and Paris. We were excited to see them and to have an excuse to show them around London and do some more exploring ourselves. We didn’t take nearly enough photos during their visit so maybe they can share some of theirs to add to this post. Each time we have had visitors in London we have eagerly asked them “Would you like to visit the Tower of London?” thinking we should save visiting the Tower until we had visitors to share it with. And each time our visitors said “Nah, that’s okay.” So we were thrilled when Marsha and Judy said yes. 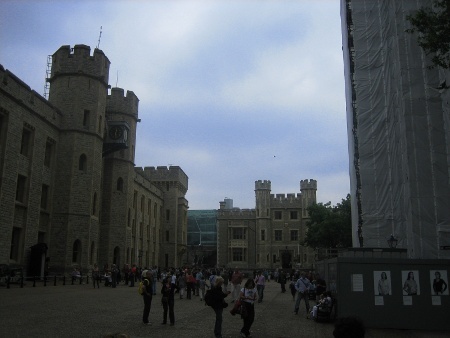 So we finally had a chance to visit the Tower during the day (see previous entry re: the nighttime Key Ceremony) and see the Crown Jewels which are suitably impressive. 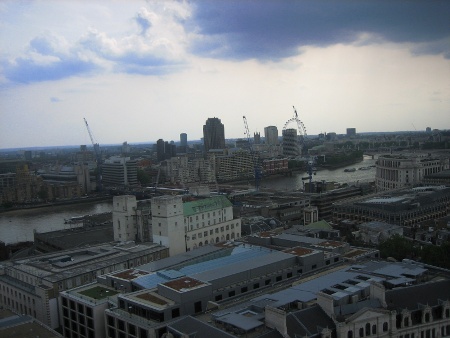 We also took the chance to finally visit St. Paul’s Cathedral and visit the crypt and climb the steps to the dome to enjoy the views of the city. 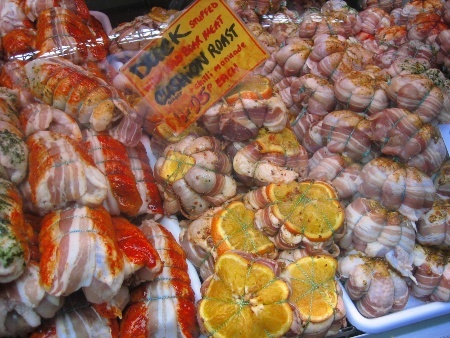 We spent an afternoon wandering Borough Market enjoying the sights and smells. Judy and I particularly enjoyed the mushroom pate. If you haven’t tried – go now! We snapped some photos of bacon. We spent sometime at old favourites like the British Museum, Vietnamese restaurants in Shoreditch, enjoying prawns on toast at the Nobody Inn and sampling pub food around London. I didn’t manage to get any photos of these spots. While the weather was mostly grey and cool during Judy and Marsha’s visit, we did get one day where the sun tried to poke out and we took advantage by heading over to Primrose hill to enjoy the view, try out a new pub – The Princess of Wales – and wander through the rose garden in Regent’s Park. Marsha has all the photos but we hit the garden in prime rose blooming season. It was beautiful! This entry was posted on Saturday, August 21st, 2010 at 4:01 pm	and is filed under Carolyn, Life Abroad, London. You can follow any responses to this entry through the RSS 2.0 feed. Both comments and pings are currently closed. I do, indeed, have tons of wonderful pictures. If someone will tell me how to get them posted, you will enjoy many wonderful moments again….I know Aunt Judy and I did the first time around! Entries (RSS) and Comments (RSS).20 queries. 0.262 seconds.